ORIS, a brand of ACPS Automotive, is one of the world's leading manufacturers of tow bars, bike carriers and roof bars. As a partner of the international automotive industry, it supplies almost all major car manufacturers worldwide. More than 1600 employees work on the implementation of market and customer requirements and thus on the success of the company. 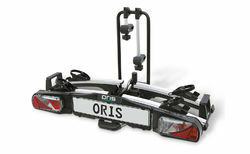 ORIS bike carriers are equally suitable for bicycles and e-bikes. The different carriers can be folded into an extremely compact format, fit on all conventional tow bars and are of high quality workmanship and very stable. A novelty is the ORIS bicycle carrier FIXMATIC, an innovative and patented adapter solution for the ball neck of the FIX4BIKE hitch systems. Thanks to the unique fastening system, the bicycle carrier is mounted with just one click and, thanks to FIX4BIKE, can be aligned immediately. A noticeable plus in safety, stability and longevity.